Of all the marketing techniques I involve myself with, I like email marketing the least. While some people are able to breeze through the ins and outs, it took me many years to learn the various methods for successful email campaigns. One of the most important lessons I have learned is to build organic email lists as opposed to borrowed, scraped, or purchased lists. Some of this may seem like commons sense, but the little things with email marketing can make or break an email campaign. Forgetting the importance of organic lists can harm you more than you think. 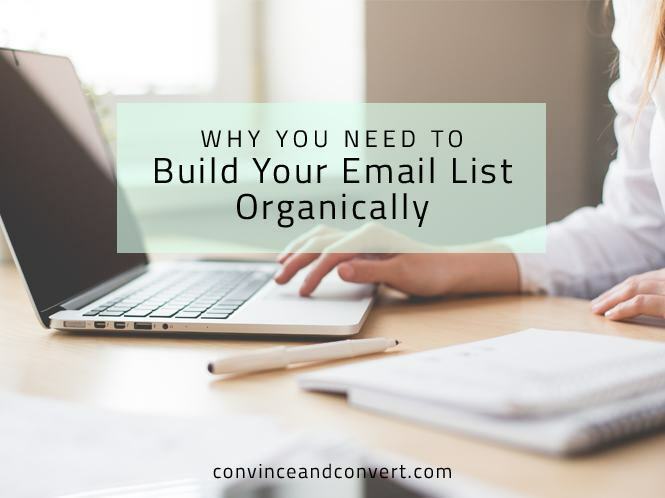 If you want to be effective with your email marketing, then make sure to focus on organically building your list. This is an obvious stat, but some marketers overlook it. If you send to a list of people who requested to receive your email, the likelihood of it going to an actual email address is higher. In fact, many of the “paid-for” lists have fake emails that people use simply to place their name on the list (either a giveaway, or paywall access, etc.). They never intend on receiving an email when they signup. In addition to emails actually reaching their target, organic lists also give you better open rates. Gretchen Roberts from Smoky Labs detailed a recent test she conducted which shows how open rates are much better for organic lists. “I recently ran two email campaigns that were structured exactly the same, except one was a cold, purchased email list, and the other was sent to an organically-grown email list that normally receives a weekly newsletter.” The results? You guessed it: a complete failure for the cold list. Overall, organic lists will give you leads that actually reach their target and will more than likely be opened, as the person receiving the email actually wants to see what you have to offer. Look, I scrape emails as well, but they are for one-time, specific, targeted offers to people who are more than likely going to use my service. Also, I don’t simply scrape and send. I vet everyone on the list and ensure that they will in fact be a qualified lead. I also never add scraped emails to my email lists, as they never signed up to receive emails. They are used one time and then discarded, unless I receive a reply. As such, I consider these as low quality leads. Brand engagement is also important for your email campaigns. An organic list contains leads that have signed up and WANT to hear from you. They are sitting there waiting to see what you have next for them. Not only is there no brand interaction with people who want it, but you are giving a bad impression to people whose first impression of your brand is coming from a purchased email list. I cannot emphasize this enough: You simply cannot judge the success or failure of an email campaign unless you use an organic list. Here is why. Let’s assume you are selling an e-book that is specific to website building. Wouldn’t you think it’s better to target website developers or people looking for a website? These are the people looking for the information and more than likely to open your email. Let’s suppose you purchased an email list from a company that says the recipients are your target audience (although you did not vet the list yourself). You build a landing page that is likely to convert, and you also create one of the most brilliant emails ever and send it on its way. If you receive zero return on that email, can you really judge how well the email was written or how well the landing page was designed? The simple answer is no. Your landing page may be one of the best ever and likely to convert a large percentage of visitors—“targeted visitors,” that is. If thousands of people come to the page, and none of them are really the target audience you want, then you will think your landing page is not successful. Now, let’s suppose you have an organic list that is targeted to people who are more than likely going to purchase the e-book. This is a list that you collected on your own, and the people on the list signed up to receive email updates on how to build websites. You use the same landing page and same email and send it out. Now you can measure true conversion. If your campaign doesn’t convert, then the issue is likely with the landing page or the email itself. After all, the people coming to the page are the most ready to buy the book. It may not seem like rocket science, but having an organic list over one that is purchased or scraped is a huge deal. It can be the difference between a successful email campaign and one that falls flat on its face. Why spend all that time preparing an email campaign if you don’t send it to qualified leads who are more likely to convert? Building an organic list takes longer than scraping or purchasing, but in the long run, it’s more effective. After all, having a 1% open rate with a purchased email list is going to net you fewer conversions than an organic list with 50%. If you are still unsure and want to try yourself, take the path of Gretchen, and run your own test. In the end, you will find it would have been cheaper to just buy me a beer while we discuss this article rather than waste your time and money on a list that converts few (if any) leads.